has introduced a new series called 'Google Earth Featured Modeler Profiles' where modelers that have submitted their work to the Google 3D Warehouse for display in Google Earth will be highlighted on a regular basis. 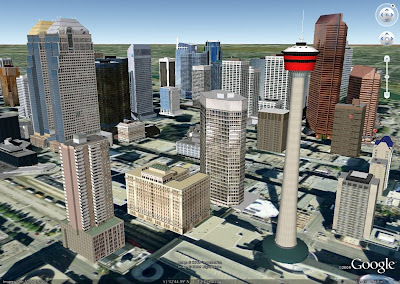 Our first featured modeler, "IntotheWest," has almost single-handedly enabled visitors of Calgary, AB, Canada to view this city in 3D in Google Earth. "IntotheWest," aka Andrew, has modeled over 40 skyscrapers and buildings in Calgary - you can check out his entire collection here. Have a look at Andrew's profile on the Official SketchUp Blog and stay tuned to learn more about SketchUp users' efforts to model their worlds in 3D. The Official SketchUp blog has introduced a new series called 'Google Earth Featured Modeler Profiles' where modelers that have submitted their work to the Google 3D Warehouse for display in Google Earth will be highlighted on a regular basis.